Chin Implant Surgery and Cheek Implant Surgery are procedures to augment chin and cheek bone. Revision Implant Surgery is the procedure to correct or change the results of a prior chin or cheek enhancement procedure. When chin implant have gone wrong, the problem can be fixed and Doctor Jacono specializes in chin and cheek augmentation revision surgery. One of the most common reasons a patient may decide to revise an implant is they do not like its size, because it is too small or too large, or they do not like the shape. Chin implants placed many years ago were called “button” chin implants that augmented only the center chin and made the chin look pointy or “witchy”. Today, chin implants come in many dimensions, and can vary in shape from more oval and feminine to more square and masculine, and everything in between. Cheek implants come in malar (cheek bone) submalar (below the cheek bone) and combined malar and submalar shapes, and these vary in different dimension and sizes. There are literally hundreds of different implant shapes and sizes. 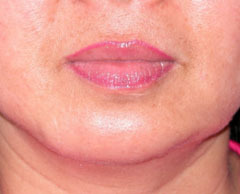 Chin Surgery Patient 1: This young woman had a chin implant performed elsewhere. The implant was malpositioned and twisted and was an old style “button” chin implant that gave her an asymmetric “witches chin”. 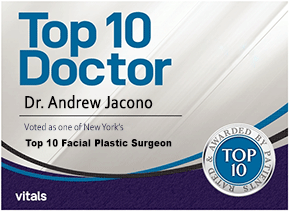 Doctor Jacono performed chin implant revision surgery by removing the old chin implant and placing one that was customized and tapered giving her a balanced appearance. No matter how well the surgeon and the patient discuss the surgery and plan its outcome, a small percentage of patients will decide they want a different implant type after surgery (because they do not like the way it looks) and require revision chin or cheek implant surgery. This requires chin or cheek implant removal, followed by placement of the new implant of desired dimension. 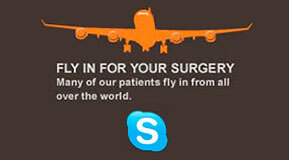 Most implants are easily removed if they are made out of silastic, silicone, Gore-Tex or hydroxyapetite. If the implant is made out of MedPor or Gore-Tex, the body grows into these implants and removing them can cause significant trauma and more bruising after surgery. 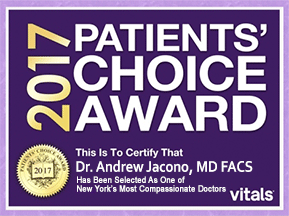 Doctor Jacono can accomplish this with incisions inside the mouth with no visible scars or using the old incision used for placement of the prior implant. Another reason for chin or cheek implant revision is that the implants are malpositioned, twisted or asymmetric. In these cases, Doctor Jacono will again repeat the incisions inside the mouth, recreate a new “pocket” or space on the facial skeleton for them to sit, and then fixate them in a symmetric and correct place. In order to accomplish this, he will often use titanium micro screws so they cannot shift or move. 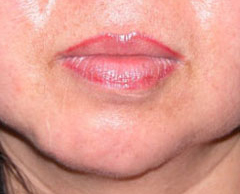 Sometimes a patient can decide they want no chin or cheek augmentation at all. In these cases the cheek or chin implant is removed and the incision for access closed. Once removed the face usually returns to its pre-operative state. If the implants were very large, and remodeled the facial skeleton and stretched the skin, sometimes fat transfers or grafting are used to fill any facial deficiencies, but this is done in a staged fashion after healing from the implant removal surgery.